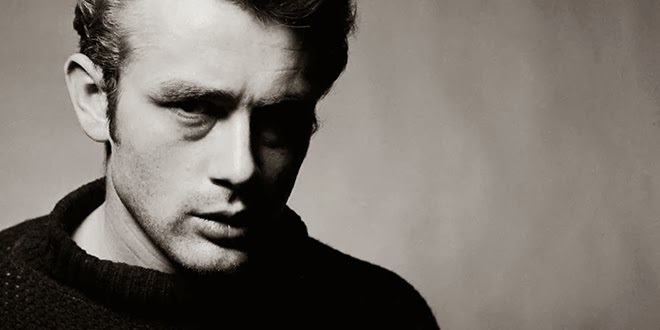 Lets start off with the obvious, James Dean was extremely good looking. The enviably handsome young actor was an icon in his own time, achieving a tremendous amount in his short time on earth - before his tragic demise in 1955 at the age of just 24. The archetypal figure of the 50's youthful rebellion, Dean seemed to single handedly dress Hollywood down. In fact, some might say he was not considered particularly dandy in his time, and nor did he necessarily aim to be. Dean's style was less considered, and perhaps more confident that that; Dean dressed like somebody who was extremely good looking. James Dean remains the essence of casual cool; never overdressed, Dean pulled off every outfit he wore in such a way that you would always see the man before the clothes. That's not to say that he didn't dress with flair or originality - you can see from the pictures above to see him working grey wool trousers into a casual look nearly sixty years before the trend even took off (now that's fashion forward). It simply means that he carried himself confidently and that he never seemed to wear anything distracting or ostentatious. A great part of Dean's effortless style is just that - effortlessness. Dean seemed to do away with superfluous items. His outfits were very often minimalistic, meaning for example that he wasn't typically seen accessorizing with a scarf or a hat. He also eschewed many fashionable affectations; it's interesting to observe that despite being an icon of casual style he doesn't often seem to roll up his sleeves (why bother?). One designer, Michael Bastian, had this idea about Dean: "I had this idea: What if James Dean came back and picked up where he left off? How would he dress?" I know what you might reasonably be thinking; is he seriously talking about catwalk inspirations? all of this about eschewing vanities and not overdressing and we are suddenly turning to catwalks for inspiration? Ah, but you see though this would be madness, there is method - the illustrious Bastian opted to centre his spring/summer collection of 2012 around his vision of a modernized James Dean. These three looks, from the stellar collection, pay homage to looks from Dean's three films; the red jacket from 'Rebel Without a Cause', the oatmeal jumper from 'East of Eden' and the open shirt from 'Giant'. What's interesting is how Bastian modernizes each look. Dean's iconic red jacket was a loose fitting bomber; Bastian updates the look by streamlining the fit and adding epaulets to the shoulders to create a more structured silhouette. This is an example of how you can take influence from Dean without necessarily taking influence from the 50's, with the look retaining it's striking use of colour and simplicity. Dean's look as Cal Trask in 'East of Eden' was preppy and simple, defined by perfect fit and the cool inclusion of a pocket watch. While a pocket watch may not be for everybody, its a good example of details being functional rather than superfluous. This look is changed from the film, aside from a nod to the fair isle trend; the timeless appeal of simple pieces in neutral tones is easy and stylish. Obviously you would turn a few heads if you were to walk down the street in a cowboy hate; this look is inspired by an outfit from Dean's final film, the epic western 'Giant'. While he certainly immersed himself in the lifestyle, I would still doubt that Dean would have gone about his daily business in a cowboy hat under normal circumstances. This look does have a rugged and masculine appeal though - great denim and a few undone shirt buttons (how many depends on whether you have a T-shirt on) will make you look like you have something manly to do come the warmer seasons. "I was fascinated by the fact that he always looked so good, regardless of what kind of clothes he stumbled into; he could wear an old rag and he was still quite stunning, and equally he could clamber into a tuxedo and it would also be incredibly fetching. So for me he is the only person who looked perfect persistently." I don't think I could have said it better myself. As always, may the odds be ever if your favor.